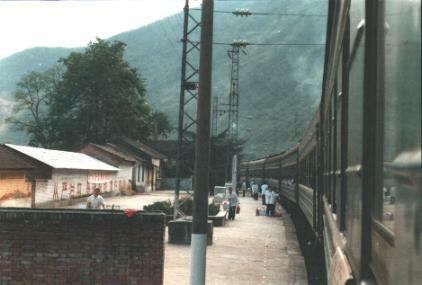 BEIJING, SEPTEMBER 1999 - Traveling by train is always interesting. In China it is a real experience. Not only the buying of the ticket is a challenge (I had the tour company doing this for me), finding out how train travel 'works' is as exiting. Waiting in the main hall of Beijing railway station is already impressive. 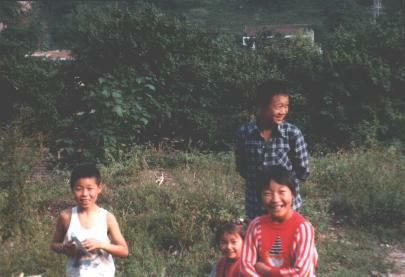 A lot of Chinese use the train to visit their family, or to go to school (university) or work. A lot of people still don't own a car and distances are big in this country ! All of the passengers are waiting in one big hall - mostly standing or sitting on the ground or on their luggage. As soon as the gate to the platform opens, everyone starts rushing through that gate. Since all places on the train are numbered, there is no need to hurry, one would think - but luggage space is limited (and some of them have a couple of chickens with them or a sack of vegetables). We just didn't care and waited till the crowd had gone through the gate to go to our train. As soon as we had found our carriage, we had to hand over our ticket to the guard of this carriage. He gives you a metal or plastic token and folds the ticket in such a way that it fits into his 'book'. This 'book' is his tool for knowing where everyone is going and where everyone is located on the train. In the morning he will come by some time before your stop, to return your ticket and collect the token - never loose this token, this would distress the system heavily ! On the train there are great opportunities to discover the Chinese people. As ticketing is not centralised, each railway station has some places reserved for the train. 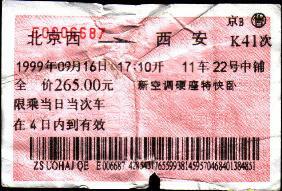 When buying a ticket, finding adjacent places is often not possible, which results in a mixture of Chinese and the odd tourists in the same compartment. Conversation is not easy, but with the help of a little phrase book, you can manage fairly well. Usually the Chinese are very interested in looking at your guide books etc... On one of my train travels I have encountered a Chinese Civil Engineer that spoke English almost fluently. This was an ideal situation as he could be my interpreter. Another good thing is to bring a bottle of wine or spirits, to share with the Chinese, you'll make friends easily. The Chinese railways have three classes of carriages : 'soft sleeper', 'hard sleeper' and 'hard seat'. I've traveled in the first two ones, the last mentioned is just an overcrowded carriage with wooden benches. People are everywhere, including under the benches, in the aisles, even onto the overhead luggage rack. Making your way through such a carriage is a hard job. A 'soft sleeper' compartment has soft beds, only 4 of them, and a door that you can close. The 'hard sleeper' compartment has 6 not too hard beds, but no doors at all. As a train travel can take up to 20 hours, people have brought their food to prepare & eat on the train . It can get very messy after a couple of hours (I'm deliberately not mentioning the toilets !). On each train you can also get thermos cans with hot water to make tea. They use a coal fire to boil the water. For the 'rich' traveler, there is a restaurant carriage. The food is not according to high standards here, but they really cook everything on the train ! At one occasion when sitting in the dining carriage, the kitchen seemed to be on fire ... which was quickly extinguished. Another great thing about train travel in China is the stops in the railway stations. On every occasion people approach the train or even board the train to sell something, mostly food or drinks. Mostly the scenes are interesting and colorful. Sometimes the train stops in the middle of nowhere - because of some technical problem or because another train has to pass by. Then you have the kids of the country side approaching the train. Giving these children a postcard of your home country or just talking to them in English (some of them speak some English) is just plain fun ! As a tourist you are the big attraction !